Takahashi FSQ-106ED @ f/5.0 (530 mm F.L.) Captured at 2.1 arcsec/pixel. Shown at 3.15 and 7.56 arcsec/pixel. SBIG STF-8300M Self Guiding Package w/ mono ST-i, using AstroDon RGB filters. 4/18/2016 Chino Valley, AZ with CCD Commander & CCDSoft. CCDSoft, PixInsight & Photoshop CS6. PixInsight processing includes calibration, registering, stacking, RGB creation, gradient removal and non-linear stretching with HistogramTransformation. PhotoShop to combine the comet and star aligned images. 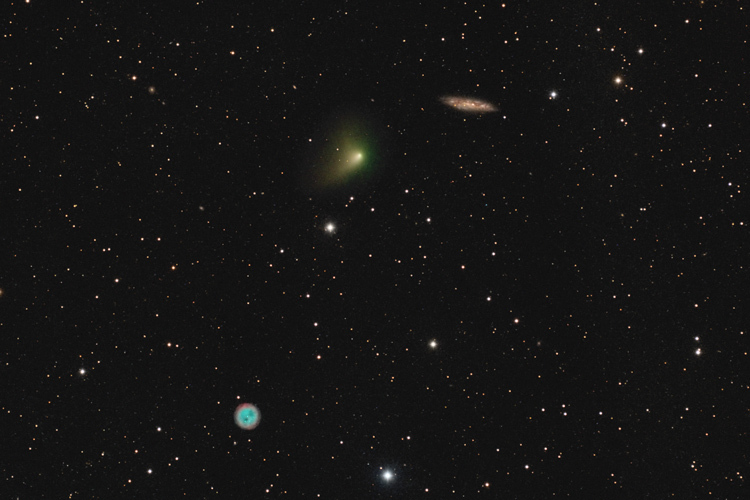 Comet C/2014 S2 (PanSTARRS) poses for a Messier moment in this telescopic snapshot from April 18. In fact it shares the 1.5 degree wide field-of-view with two well-known entries in the 18th century comet-hunting astronomer's famous catalog. Outward bound and sweeping through northern skies just below the Big Dipper, the fading visitor to the inner Solar System was about 18 light-minutes from our fair planet. Dusty, edge-on spiral galaxy Messier 108 (upper right) is more like 45 million light-years away. A planetary nebula with an aging but intensely hot central star, the owlish Messier 97 is only about 12 thousand light-years distant though, still well within our own Milky Way galaxy. Astronomers expect the orbit of this comet PanSTARRS to return it to the inner Solar System around the year 4226.